As more and more human activities are being held in some kind of parallel world, also known as ‘cyber space’, ‘virtual area’ or so, smartphone applications developers try hard to put sailing there as well. I am absolutely aware that real sailing is impossible to be substituted, but still more and more innovative sailing applications appear on ‘shelves’ of virtual stores. 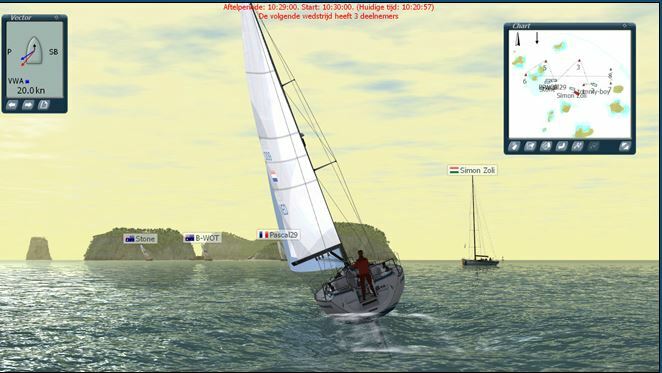 SailSim is an application that simulates sailing conditions on the screen of an iDevice (any smartphone or tablet using iOS), providing the user a sense of being onboard sailing yacht. The application would show the position of sails under different wind directions and the effect on boat speed. The latest version of the app provides the users to model their own boat. All parameters that matter for the sailing can be customized and adjusted while the application will calculate it all and show you the effects of your maneuvers. The application is available at the App Store, while some enhancements and upgrades can also be found online. I would like to suggest this application for beginners who haven’t felt real sailing yet. As young generations live with smartphones and applications from the very beginning of their lives, this application could help their manner of thinking in the moment when theory has to be accepted and visualized. Once they embark a dinghy or a real sailing yacht they should all connect causes and effects of wind action to the boat and the application should be forgotten. Additionally, the application could find its use onboard when some inexperienced crew members embark the vessel, when skipper is explaining what happens and how to react. In other cases, the application can be used as a time killer during long winter sailing-less days.